Hey! Welcome to the She Yearns Podcast! Have you ever felt stuck? Struggled with timidity? Felt like you couldn’t put your finger on it, but something was holding you back from moving to that next place with God? Maybe God is beckoning you to live more courageously for Him. 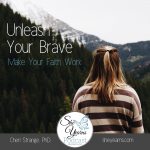 James calls us to do just that, learning to Unleash Your Brave. That’s what this series is about. And today we are focusing on prayer that works. Often we find ourselves in situations beyond us. We don’t have all the answers. Sometimes it’s relationship woes or even disasters. Maybe it’s something at work. It could be money issues. kids, parents, friendships–all of it can leave us breathless and without resource. What do we do when we don’t know what to do? James gives us some practical advice for where to go and what to do and it all centers around something as simple as prayer. This episode looks intently at what James calls us to do and helps us walk it out so that we can practice prayer that works in any and every situation. I am so excited about this episode as it ushers in our second season with the She Yearns Podcast! I cannot wait to watch it unfold and I’m so happy you are here. Thank you for coming along! May God speak to you exactly the way you need it through His Word. Just so you know — you can now find today’s episode, Prayer that Works and other episodes of the She Yearns Podcast from iTunes, GooglePlay, Stitcher, or SoundCloud. Just click on the links below! As always, you can scroll down and listen right here!